James Starley's Rover of 1885 was the first successful bike in which pedals and a crank drove the rear wheel with a chain, but he was not the first with that design. 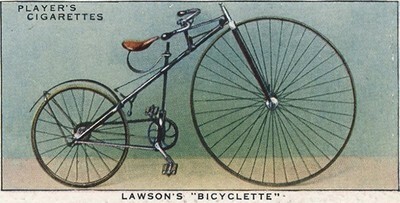 In 1879 Englishman Harry Lawson designed and patented a version of a large front wheeled bike with a smaller rear wheel driven by cranks and a chain. Lawson's bike was not very well received, and he went on to design bikes using levers for power transmission. The Bicyclette was a commercial failure, but he had hit upon a superion design feature. You confuse James Starley, father of the cycle trade, with his nephew John Kemp Starley, inventor of the Rover safety bicycle in 1885. 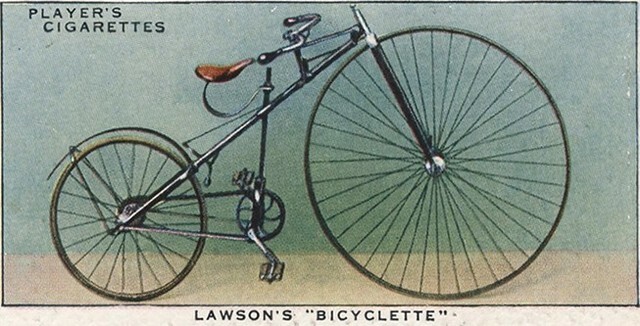 Harry Lawson was working for Rudge & Co. when he designed the unsuccessful 1879 Bicyclette but his lever driven safety, the Sussex giant, taken up by Singer, preceeded this. Becoming a company promoter and eventually landing in gaol, perhaps his best claim to fame should be the first lady's bicycle in 1874.